Habit: Annual, not heterostylous. Stem: 5--30 cm, glabrous to +- scabrous; branches often at base, decumbent to weakly ascending or erect. Leaf: 0.3--2.5 cm, lower opposite; upper alternate, oblong to oblanceolate. Inflorescence: flowers 1 per axil on main shoots and on short axillary shoots, +- sessile; +- glandular. 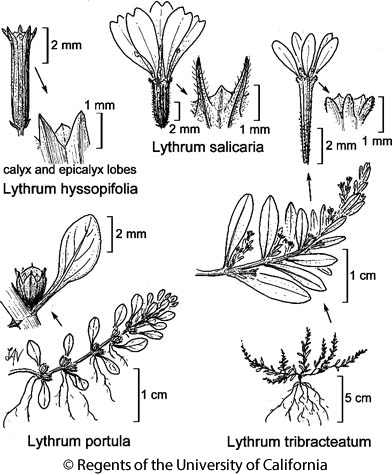 Flower: hypanthium 5--6 mm, narrowly cylindric, 8--10 × longer than wide; sepals, epicalyx lobes +- 0.5 mm, thick; petals < 3 mm, lavender; stamens 4--6, included; style included. Fruit: cylindric, +- = hypanthium. Chromosomes: n=5. Citation for this treatment: Shirley A. Graham 2012, Lythrum tribracteatum, in Jepson Flora Project (eds.) Jepson eFlora, http://ucjeps.berkeley.edu/eflora/eflora_display.php?tid=32409, accessed on April 23, 2019. NCoRI, GV, CCo, SnFrB, n MP; Markers link to CCH specimen records. Yellow markers indicate records that may provide evidence for eFlora range revision or may have georeferencing or identification issues. Purple markers indicate specimens collected from a garden, greenhouse, or other non-wild location.